Join us for an interdisciplinary panel discussion with with artists Annesofie Norn and William Trossell (ScanLAB Projects), curator Markus Reymann (TBA 21-Academy), and oceanographer Patrick Heimbach (The University of Texas at Austin), moderated by Ulrike Heine, curator of Exploring the Arctic Ocean. The discussion will be followed by a reception in the Visual Arts Center. Organized by the Institute for Computational Engineering and Sciences (ICES) and the Department of Art and Art History, The University of Texas at Austin. Annesofie Norn is a visual artist, scenographer and curator working at the intersection of art, humanitarian development, and public engagement. 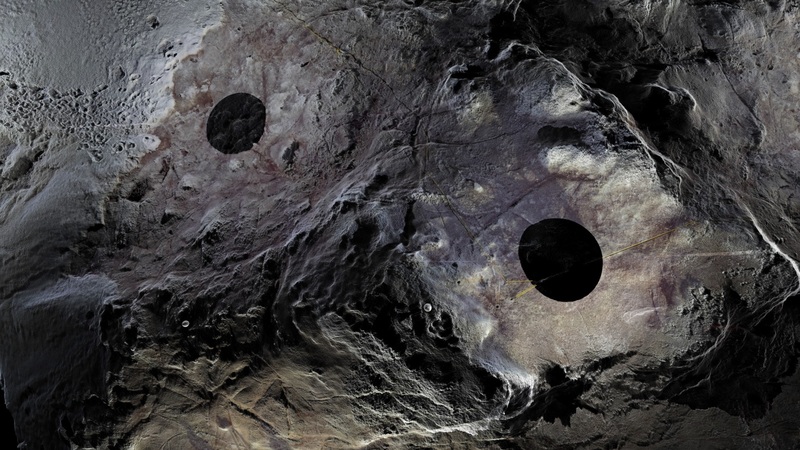 Her works, which often involve situated engagement, investigate modes of mapping, measuring, and observation. Norn currently leads a long-term project for the United Nations, in which she explores the potential of participative storytelling together with internally displaced families in Gaza. Together with Ole Kristensen and Daniel Plewe, Norn produced the documentary and video installation “Longing Fast Forward,” which is on view in Exploring the Arctic Ocean. William Trossell is an artist, architect, and technologist. He is the cofounder of ScanLAB Projects, a pioneering creative practice that is half art studio and half research laboratory. From 2011 to 2013, while working for the Climate Impact Tour with Greenpeace and Cambridge University aboard the icebreaker The Arctic Sunrise, ScanLAB Projects captured 26 ice floes in forensic detail in the Fram Strait using LIDAR 3D scanning technology. Replicas of the floes and other forensic records were exhibited in Frozen Relic: Arctic Works at the AA Gallery, Royal Academy and the Louisiana Museum of Modern Art. Parts of the project are on view in Exploring the Arctic Ocean. Markus Reymann is the director and cofounder of TBA21-Academy. Since July 2011, he has initiated and conducted numerous expeditions; each trip is designed as a collaboration with invited artists, scientists, and thinkers who are eager to embark on oceanic explorations. In December 2015 at the 21st Conference of Parties (COP21) in Paris, Reymann announced TBA21-Academy’s latest program, “The Current,” which was conceived to raise awareness of today’s most urgent ecological, social, and economic issues. Patrick Heimbach is an associate professor at The University of Texas at Austin with appointments in the Institute for Computational Engineering and Sciences, the Institute for Geophysics, and the Jackson School of Geosciences. His research focuses on the ocean circulation and its role in climate, as well as on the dynamics of the polar ice sheets, oceans, and sea ice. He directs the Computational Research in Ice and Ocean Systems (CRIOS) group. Heimbach is a member of numerous international research consortia and has been an invited scientist to convenings of TBA21-Academy. Ulrike Heine is a visual studies scholar and curator with a focus on the intersection of visual arts and ecology. She completed her PhD with a thesis on climate change-related imagery. From 2013 to 2016, Heine was on the curatorial staff of the MIT Museum in Cambridge, an institution working at the intersection of science, technology, and the arts. She is the curator of Exploring the Arctic Ocean.